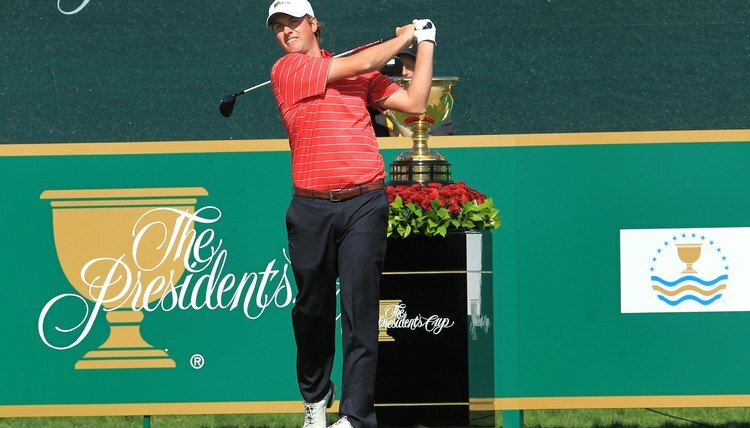 In match play, like The President's Cup, two golfers go head to head to earn points for their team. Match play is a popular style of golf among spectators, as the head-to-head competition format can make for exciting showdowns. In match play, the overall score of a round does not matter; rather, a player simply must shoot better on more holes than his opponent. In match play golf, each hole is like its own small competition, equal to every other hole, making magnitude of victory irrelevant. If a player wins the first hole by three strokes, then loses the second and third holes by one stroke each, she is behind in the match, despite her stroke lead. This scoring rewards risky play. For example, a shot over a water hazard in stroke play is risking two strokes in penalty for the chance to shoot one lower, while in match play you are risking losing a hole for a chance to win a hole, making a more balanced risk-reward scenario. Scores for strokes in a hole are scored the same as in a round of stroke play, meaning a ball lost in a hazard costs a player the same number of strokes on his score for the hole. Once it is determined who has the lower score for the hole, match play's scoring comes into play, with either one player being awarded the hole, or the players tying and the hole being declared "halved." While players are essentially accumulating points, with one point for winning a hole and 1/2 each for a tie, scoring is not looked at as a total of, for example, 3 to 1. Instead, the player with three would be called "two up," while the other player is "two down." Competitors don't always have to play 18 holes to determine the match winner. If, after 15 holes, Player A has won two holes and Player B has won six holes, Player B is four holes up. As only three holes remain, the best Player A can finish is one down, meaning Player B has won the match. As players are not competing against an entire field, but rather directly against one opponent, they may concede. A player can concede an entire hole by determining there is no way for her to score lower than her opponent, such as when the opponent has a short putt left and has taken two fewer strokes. She can concede a shot to an opponent, which simply means the putt is so short the players can assume the player will make it. For example, if Player A's second shot finishes inches from the hole, Player B would concede, and Player A would take her score of 3. Match play is frequently used in competitive cups, such as the Ryder Cup and Presidents Cup. In these competitions, matches are played head-to-head only on Sunday. On Friday and Saturday, players square off in groups of four, with two players from each team in each group, playing a variety of matches such as foursomes and four-ball. Each match is worth one point in the overall competition, with 1/2 point awarded to each team if matches are tied after 18 holes. What Is the Difference Between Match & Stroke Play in Golf? How Do You Play Skins in Golf? What Is a Four Ball Golf Match? How Is the Score Kept in Golf?